uuid : a8711b15-097a-4870-9cb0-e33405686753 templates_id: 119540 templates_uuid: "be6c5710-2cb3-402f-ab04-9960af4a24a0" title: "Disciplinary Appeal Letter - Notice of Appeal Hearing Template " display_name: "Invitation letter to a disciplinary appeal hearing for misconduct" meta_keywords: "Employee misconduct appeal notification and Notice of appeal hearing" description: "
Make sure you do things right when you discipline an employee, with this \r\ndisciplinary appeal letter used to invite an employee to a disciplinary appeal hearing. The notice of appeal hearing sets out in clear and simple terms the process to be followed and the employee\'s rights, helping ensure that the employer complies with the laws on unfair dismissal. It covers the arrangements for the appeal hearing, the right of the employee to bring a companion, witnesses at the hearing and witness statements. 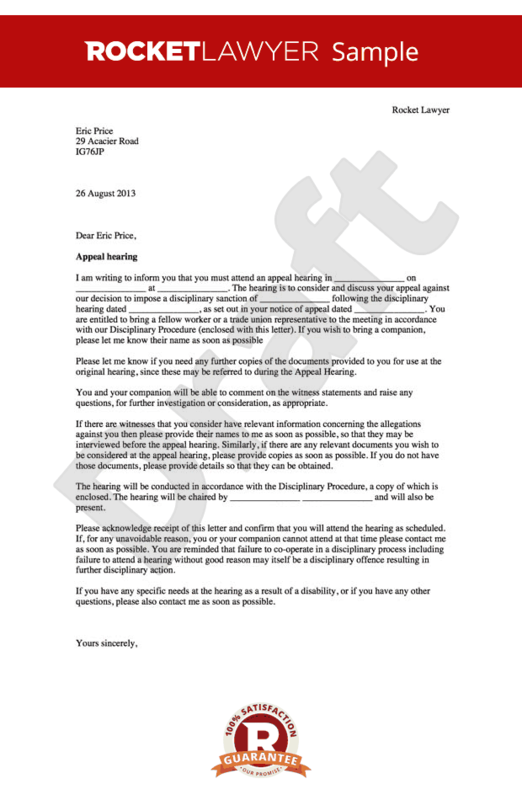 What is an invitation letter to a disciplinary appeal hearing for misconduct? A invite to an appeal hearing should be sent out in advance of any appeal which follows the initial disciplinary hearing. Why do I need a appeal invitation? If you are formally disciplining an employee and the employee requests an appeal this letter helps to ensure an employer complies with the laws on unfair dismissal. In particular it is designed to fulfil certain requirements of the statutory ACAS Code of Practice on Disciplinary and Grievance Procedures. Do I need to allow an appeal? The right to appeal against the outcome of disciplinary action is an important element of a fair disciplinary process and the ACAS Code of Practice on Disciplinary and Grievance Procedure states that the employee should be given the right to appeal against any disciplinary sanction or decision imposed. What details should be included in the letter? Make sure that you include enough information about the appeal hearing. It is important to agree a time and venue for the appeal hearing, along with who will be conducting the appeal hearing. If the appeal hearing is a review of the original decision or a full re-hearing of the case, then state this. It is important to notify the employee of their right to be accompanied at the appeal hearing. This is a statutory requirement. How should the appeal hearing be conducted? The appeal may proceed either as a full rehearing, effectively re-running the first stage of the process or as a review, where the procedural fairness and severity of the original decision will be scrutinised by a new person. An effective right to appeal can remedy procedural defects in the original decision, if correctly handled. Read How to run a disciplinary hearing for further information. Do I need to comply with the ACAS Code? Compliance with the ACAS Code of Practice on Disciplinary and Grievance Procedures will be taken into account by an employment tribunal in deciding whether an employee has been treated fairly and can also impact on the amount of compensation awarded if the case went to court. Care must be taken to ensure that in addition to the ACAS code and any guidance on disciplinary matters arising under common law, any specific contractual rights of the employee and policies of the employer are complied with. The contract of employment should be checked and also any written disciplinary policy. Who should run the appeal? The ACAS code states that an appeal hearing should be conducted by a manager or other senior member who has not previously been involved in the proceedings. It is not essential that the person hearing the appeal is more senior but this is recommended to ensure impartial decisions and overall fairness. Who else should be present at the hearing? The ACAS code says that the employee must have a reasonable opportunity to call witnesses to the hearing and the opportunity to make points to the meeting about witness evidence. If possible it can be useful to have an HR person present to ensure the right process is followed. You should also have someone there to take minutes of what happens at the meeting. Also, a witness may be present.
" created_timestamp: "2018-10-08 04:36:45.0" modified_timestamp: "2018-10-08 04:36:45.0" active: true created_by: 236 modified_by: 236 dcm_id: 236 url_slug: "Letter-inviting-an-employee-to-attend-a-disciplinary-appeal-hearing" meta_description: "Create a disciplinary appeal letter to invite an employee to a disciplinary appeal hearing with simple guidance from Rocket Lawyer. Make sure you do things right when you discipline an employee. Try this notice of appeal hearing." time_to_complete: "10 minutes" role1: "Employer" role2: "Employee"
Make sure you do things right when you discipline an employee, with this disciplinary appeal letter used to invite an employee to a disciplinary appeal hearing. The notice of appeal hearing sets out in clear and simple terms the process to be followed and the employee's rights, helping ensure that the employer complies with the laws on unfair dismissal. It covers the arrangements for the appeal hearing, the right of the employee to bring a companion, witnesses at the hearing and witness statements. More than just a Invitation letter to a disciplinary appeal hearing for misconduct template, our step-by-step interview and guidance makes it easy to create your document. Easily create online, download, print and sign your free Invitation letter to a disciplinary appeal hearing for misconduct in minutes. This document is also sometimes called: Employee misconduct appeal notification and Notice of appeal hearing.